What is cylinder head gasket? Cylinder head gaskets are located between the cylinder head and the engine block deck and form the most crucial part in a combustion engine. The cylinder head, customised for each vehicle, used in combination with a head gasket, seals the cylinders of the car with precisely milled surfaces to provide a smooth fit with all associated parts. What does cylinder head gasket do? Cylinder head gasket is built from carefully chosen materials to withstand hot combustion temperatures and seal coolant and hot engine oil flowing under pressure between the block and head. Many cylinder head gaskets are able to measure the coolant flow to ensure proper circulation. Cylinder head gasket seals the combustion process and prevents the coolant and engine oil from mixing together in the combustion chamber preventing deterioration of gasket�s surfaces. A blown head gasket can cause engine malfunction and significant loss of engine power. What causes a cylinder head gasket to blow? 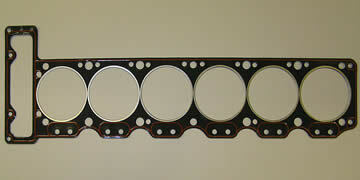 Cylinder head gasket can become faulty due to number of factors. The most common cause of cylinder head cracking is overheating. When a vehicle overheats, it puts pressure on all metal components resulting in cylinder head cracking and leakage. Cylinder head cracking has become more common as car manufactures use mixed metals in their engines. Many vehicles use solid cast iron engine block combined with an aluminium cylinder head creating an uneven expansion rates of these metals resulting in a blown head gasket, engine malfunction and significant loss of power. Overheating or loosing coolant indicates that a head gasket has blown or leakage occurred. Cylinder head cracking can also be caused by engine�s hot spots triggered by uneven expansion of engine parts, leaky hoses and pre-ignition in the engine�s cylinders. How to prevent a cylinder gasket from cracking? Observing engine�s temperature and checking engine coolant level can prevent or minimise the damage to a cylinder head gasket cracking. To prevent overheating, drivers need to make sure that the radiator is filled and in good condition with a tightly sealed cap. Checking belts, hoses, fans and engine�s thermostat for faults can easily determine whether a cylinder head gasket is working efficiently. Please contact us to find out more about our cylinder head gaskets.